It was my mom’s birthday on Wednesday so on my way to work I stopped by the grocery store to buy her flowers. I brought my own vase and instead of paying a lot of moolah for a pre-made bouquet, I was just going to make my own. Daffodils were only $2 a bunch and there were all sorts of different colored tulips. 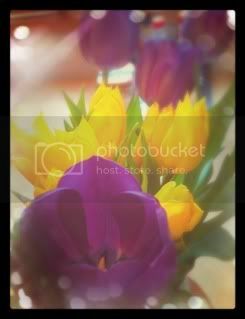 I decided on a simple arrangement of daffodils and purple tulips. When I went to pay for them, the young woman behind the counter told me that daffodils are toxic to other flowers, so if you mix them, the other flowers will die. I was surprised that a grocery store clerk knew this. I had worked at this very same flower department when I was 14 and I knew very little. I just loved flowers. 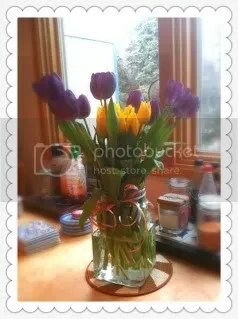 So I took her advice and went for yellow and purple tulips. I gave this last advice to my mom upon floral delivery and she told me she tried it out and it totally worked. I guess a little air bubble gets stuck in the stem after it has been cut, so a little hole lets the air escape and get to the bloom.